Bridging the traditionally separate domains of analytic and Continental philosophies, Pamela Sue Anderson presents for the first time, a feminist framework for studying the philosophy of religion. Pamela Sue Anderson is Senior Lecturer in Philosophy at the University of Sunderland. Part I: Introduction: Background Matters:. 1. Reason, Belief, and What is Excluded. 3. Contemporary Philosophy of Religion. 4. Thinking from the Lives and Beliefs of Others. 5. Anticipating Configurations and Refigurations. Part II: Epistemological Frameworks of Belief:. 1. The Rationality of Religious Belief: Reason in 'Crisis'. 6. The So-Called Crisis of Rationality. 7. Religious Belief, Experience, and Epistemetic Duty. 8. The Empiricist Privileging of Formal Rationality. 9. Epistemological Frameworks of Belief. 10. Questioning the Neutrality of Rationality. 12. A Critique of Reason. 2. Feminists and the Rationality of Belief - I: Strong Objectivity. 13. Rationality and Epistemological Frameworks. 15. Objectivity as Too Weak. 17. The Subject of Feminist Standpoint Epistemology. 18. What is Still Lacking for Feminist Belief. 3. Feminists and the Rationality of Belief - II: Female Desire. 20. New Content for Belief. 21. Desire and the Rational Subject. 22. Sexually Specific Discourse and the Numinous. 23. Post-Patriarchal Philosophy and Religion. 24. On the Buried Maternal. 25. A Feminist Modification of Rational Belief. Part III: Refigurations of Belief:. 4. Myth, Mimesis, and Religious Belief. 26. Reason, Embodiment and Belief. 29. Sexual Identity in Religion. 31. A Regulative Ideal: Reason and Desire. 5. Figuring the Rationality of Religious Belief: Belief, Action, and Devotion. 32. Figuring Belief: Reinventing Ourselves as Other. 33. Rational Passion and Female Desire: Yearning. 34. Reading Beliefs in Myths of Dissent. 35. Marginality and Dissent: Antigone and Mirabai. 36. Dominant Configurations of Religious Devotion. 37. Rationality of Belief Mimed. 38. Preliminary Conclusion: Yearning Assessed. 39. Reason and the Philosophical Imaginary. 40. Enlightenment Rationality and Patriarchy. 41. Reason's 'Crisis' and the Female Symbolic. 42. Belief and the Existence of a Personal Deity. 43. The Problem of a Universal Assumption: Patriarchy. 34. Death and Woman: Destructive and Creative. * Contributes to a rapidly expanding field of study. 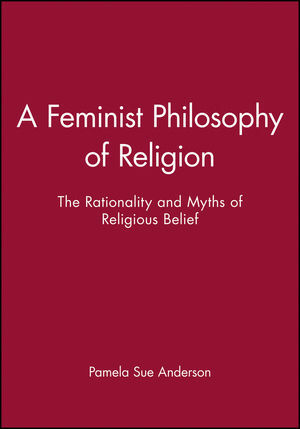 * Presents the first feminist framework for the study of philosophy of religion. * Balances the study of both religion and philosophy.